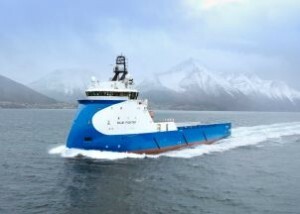 After the delivery, January 19, of Blue Fighter, the Norwegian shipyard Ulstein Verft has set afloat, May 9, the second Platform Supply Vessel (PSV) of the type PX121. ordered such as by Blue Ship Invest, Blue Prosper measures 83.4 meters long and 18 meters wide. Featuring a deadweight of 4200 tons, this ship, which adopts the X-BOW design with inverted bow, Capable of speeds of 15 knots and 24 persons, the vessel can implement a system to fight against fire FiFi II. The Blue Prosper must be delivered in August.